College marching bands aren’t the only ensembles that head out to prestigious bowl games during the holiday season. Many high school groups have the opportunity to travel and benefit from performing on this national scale as well. The roar of the crowd and the thud of pads upon pads on the fresh gridiron during the winter—these sounds echo through the stadiums at college bowl games where fans are treated to football in faraway and, at times, exotic locations. With various tailgates set up in the parking lot, the smell of barbeque lingers into the gate entrances with flags proudly displaying school pride waving in the breeze. And from the end zones, bands blare the refrains of their fight songs and other popular pep tunes. For college football teams and their bands, the bowl games are the culmination of a season of hard work. But college students aren’t the only ones who can experience these stimulating moments. In fact, dozens of high school marching bands have the opportunity to participate in this fascinating “college” atmosphere. For many individuals, it is a once-in-a-lifetime experience that will build memories and help them become even more inspired by what they put out on the field. This season, 13 college bowl games including the Outback Bowl, the Sun Bowl and the Sugar Bowl invited high school marching bands to perform either during a pre-game parade or as a mass band at halftime. For example, the Outback Bowl had 15 high school bands in a parade as well as in a halftime show with nearly 3,500 performers on the field. A typical high school band performs at its Friday night football game in front of a crowd of a few hundred or a few thousand. By contrast, the average bowl attendance is about 50,000. For most bands, this will be the biggest crowd of the season. The students at Fort Dodge Senior High School certainly experienced a different climate as they went from Iowa to Florida for the Outback Bowl on New Year’s Day. College bowl games are a great way to expose high school bands to the performance level and repertoire of university bands. Students wanting to move on to the next level in their marching career get a feel for the atmosphere and logistics of being in a college band by seeing it firsthand and performing on the same field. 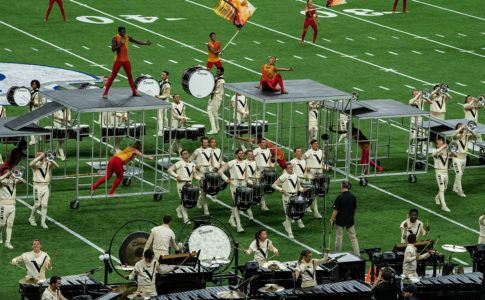 The Anniston (Ala.) High School Marching Band had looked forward to seeing the different styles of the bands that they saw at the Capital One Citrus Bowl. Some bowls, such as the Allstate Sugar Bowl, have always had a high school marching band perform at halftime, but one bowl is beginning a new tradition. The Hyundai Sun Bowl in El Paso, Texas, will now have a high school band instead of a celebrity entertainer, such as past headliners Rihanna or Los Lonely Boys. Timing logistics was the main factor in the change. The Sun Bowl, which hosts a Thanksgiving parade, used that November event as a competition to choose the high school band that would perform a halftime field show at the bowl. The committee hired judges from the area in order to choose the best band based on musicality and performance. Traditionally, high school groups that perform at bowl games submit applications as well as recorded video or audio copies of their past performances.The bands are judged based on their musicianship as well as their performance readiness. For the Woodland (Ala.) High School Marching Bobcats, it is an incredible opportunity for the band’s 72 members to showcase their best talents at the Outback Bowl after nearly being disbanded four years ago due to lack of interest. The term “once-in-a-lifetime experience” is not an exaggeration by Hamilton as most of the students come from backgrounds where money is tight. All band members needed to raise $750 in order to fulfill their share of the bowl trip costs. The band itself employed various fundraising strategies including T-shirt sales and rock-a-thons, but it’s most effective method was a simple letter to relatives. The recognition and prestige that these bands will get during the holiday bowl season is a culmination of the hard work needed in order to secure the opportunity to go on a trip and perform at a nationally televised event.